Even though you have been using APA style for the past 4 years, you may be full of dread at the thought of writing your reference list. The library is here to help! If you have been using Refworks to gather and organize your resources, you’re in luck! Download the Write-n-Cite tool to automatically format your in-text citations and generate your reference list as you type your paper. 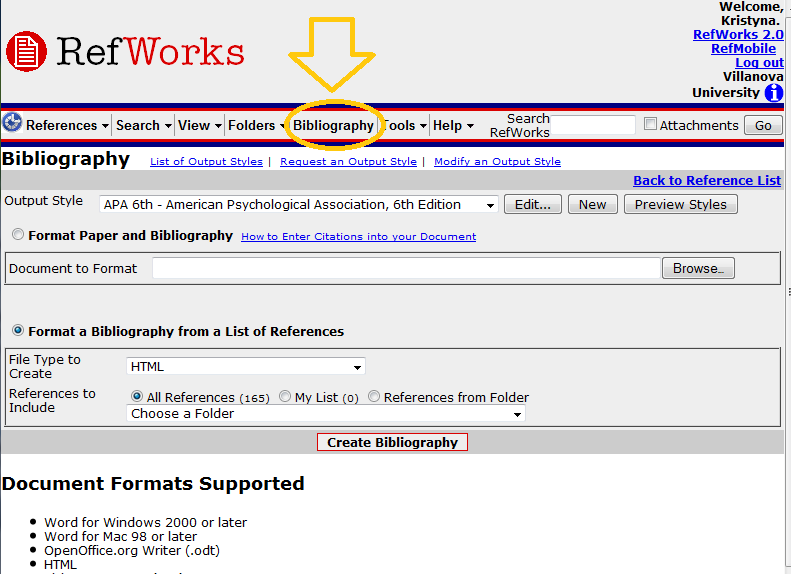 Or, use Refworks to automatically generate your bibliography. Once you have logged in, click Bibliography. Select your format style, [output] file type, and folder or list of references. Copy and paste the resulting list into your paper. Be sure to check for errors! If you need to see the Publication Manual of the American Psychological Association-the official authority on all things APA-stop by the Information Desk to browse a copy. If you find the Publication Manual confusing or scary (or both), try the APA Online Tutorial. This video guide is clear and easy to watch. It gives a thorough overview of how to format your paper and cite your sources. For those trickier scenarios (how do I cite my class notes? how do I cite a blog post? ), try searching the APA Style Blog. This is another official APA site, so it is an authoritative source. The Purdue OWL and Research & Documentation Online are clear and easy to understand sources of information for how to use APA style. Since they are not official publications of the APA, check the Publication Manual when in doubt. As always, feel free to contact me with any questions.